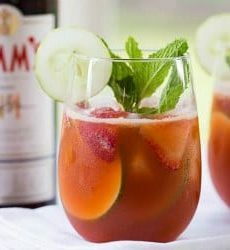 A strawberry spin on the popular English drink, a Pimm's Cup. Make the Drink: In a cocktail shaker with ice, combine the Pimm's No. 1, lemon juice and 1 ounce of the strawberry syrup and shake. Strain into an ice-filled glass and top with the 7UP. Garnish with sliced cucumber, strawberries and a sprig of fresh mint.